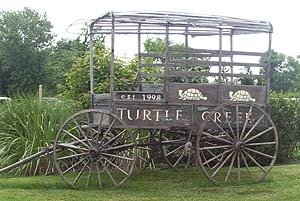 Turtle Creek Golf Course opened for play August 15th, 1997. Since then, the course has been host to many notable events from the Alex’s Lemonade Stand Event which featured Wayne Player, to golf clinics by Dennis Walters, to wrap parties for the movies ‘The Sixth Sense” and “Unbreakable’. People have celebrated their 40th to 80th birthdays under our tent and some couples thought that Turtle Creek Golf Course was the perfect place to say “I do”. We gladly sponsor the Limerick Police and Limerick Fire Company’s annual outings and we are proud to be the home course for the Spring Ford High School Golf Team. Our course has matured over the last twenty years and with the careful guidance of our superintendent John Welsh Turtle Creek Golf Course has become, as Golf Digest put it, “one of the best maintained courses in the area…with the best turf of any course in the Northeast”. We have added a new clubhouse complete with a spacious pro shop, sitting area and updated bathrooms with LCD TV's. We have a kitchen for light breakfasts and simple lunches and are proud to serve fresh baked goods from the Angry Monkey Bakery. Our dining room features a 50" HD plasma TV to keep up on sports and weather and our full bar serves up anything from an Arnold Palmer to local handcrafted beers. Our superindendant is a home brewer so we always have some unusual craft beers on hand! Turtle Creek Golf Course has added “Online Tee Time” Reservations, making it more convenient for our customers to have 24/7 access to search for and reserve tee times up to 14 days in advance through our website. Create your online “Profile” now and your efforts not only will expedite future tee time reservations, but will also speed up the check-in process so you are on the course faster!! We also added an new app so you can book from your phone. Your profile enables you to “log in” (needing only your email and password) to view and reserve open tee times – no more busy signals or having to give us your name, phone number and credit card each time. You may access our online tee time reservation system HERE. Turtle Creek Golf Course would like to thank our regular players for their patronage over the past twenty years. Without you, this milestone would not be possible. For those who are new to our course, book your tee time today and find out why so many people keep coming back to play “the Turtle”.